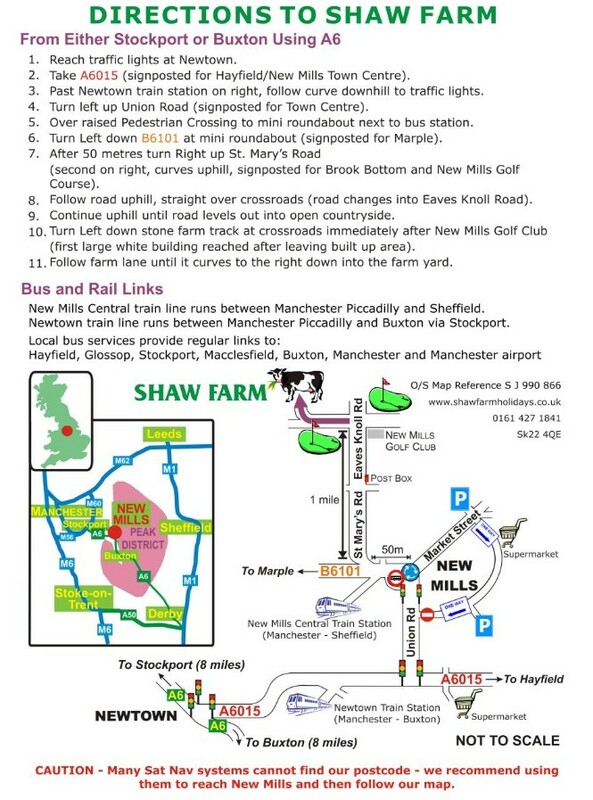 Directions to Shaw Farm from either Stockport or Buxton using A6. Reach traffic lights at Newtown on the A6. Take A6015 (signposted for Hayfield/New Mills Town Centre). Past Newtown train station on right, follow curve downhill to traffic lights. Turn Left up Union Road (signposted for Town Centre). Over raised Pedestrian Crossing to mini roundabout next to bus station. Turn Left down B6101 at mini roundabout (signposted for Marple). After 50m turn Right up St. Mary’s Road, (second on right, curves uphill, signposted for Brook Bottom and New Mills Golf Course). Follow road uphill, straight over crossroads (road changes into Eaves Knoll Road). Continue uphill until road levels out into open countryside. Turn Left down farm track at crossroads by New Mills Golf Club (Large white building). Follow farm lane until it curves to the right down into the farm yard.